Bees are so important to growing food because of the pollination services they provide. Many of our favorite nuts and fruits would be impossible without bees. But did you know there are several common bee varieties? It can be easy to confuse bee species with wasps and hornets, but there are important differences. Not least of these is that most wasps and hornets are not pollinators. 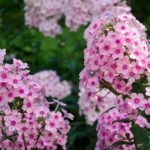 They do not carry pollen from plant to plant but may feed on nectar from flowers. This difference leads to an easy way to distinguish between most bees and non-bees: bees are hairier, which is how they can carry pollen, while wasps and hornets are smooth. The latter also tend to have more distinct color patterns. Honeybees. Honeybees were introduced to North America from Europe. They are mostly used in commercial settings for beeswax and honey production. They are not very aggressive. Bumble bees. These are the large, fuzzy bees you see in your garden. Bumble bees are the only social bees that are native to North America. Carpenter bees. Not very social, carpenter bees got their name because they chew through wood in order to make nests. There are large and small species and both have hairs on their back legs for carrying pollen. Sweat bees. 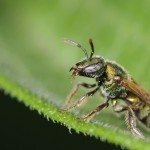 There are two varieties of sweat bees. One is black and brown and the other is a vibrant metallic green. They are solitary and are attracted to sweat because of the salt. Digger bees. Digger bees are hairy and usually nest in the ground. These bees are mostly solitary but may nest together. Long-horned bees. These are hairy black bees with especially long hairs on the rear legs. The males have very long antenna. They nest in the ground and are most attracted to sunflowers and asters. Mining bees. 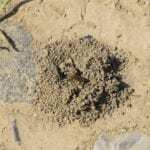 Mining bees dig nests in the ground, preferring sand and sandy soil. They are black with light-colored hairs. Some of the hairs are on the side of the thorax, which makes it look as if these bees carry pollen in their armpits. Leaf cutting bees. These bees have dark bodies and light hairs under the abdomen. Their heads are broad because they have large jaws for cutting leaves. Leaf cutter bees use the leaves to line their nests. Squash bees. These are very specific bees, collecting pollen from squash and related plants. Look for them in your pumpkin patch. They are brown with light hair and a prominent snout.